Contractors will hang power wires overhead and pull miles of cables through underground ducts in the city centre. 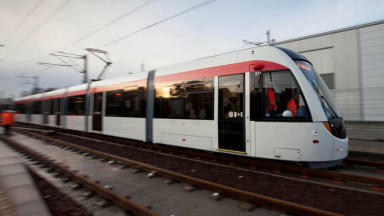 Work to install overhead and underground cables for Edinburgh's trams will begin on Monday. Contractors will hang power wires overhead and pull miles of cables and communication lines through underground ducts in the city centre. When complete it will mark the start of a testing phase to prepare the system for service next year. Work to install overhead cables at the junction of Broughton Street and Picardy Place will take place from 10pm on Monday to 5am on Tuesday. The work to install cables over Princes Street will be carried out over four nights from tomorrow when the road will be shut between South Charlotte Street and South St David Street. Underground cables will be installed from next Monday to July 13 with contractors working four nights each week. Lesley Hinds, transport convener at Edinburgh City Council, previously described the planned work as the "final major piece in the construction jigsaw" for the project. It was originally intended that the trams would run from Edinburgh Airport to Newhaven in the north for £545m but they will now terminate in York Place in the city centre and cost £776m. Your report: If you have information on this or any other story, please let us know. You can send information, pictures to web@stv.tv or call us on 01224 848918.